Dark Souls Director Hidetaka Miyazaki was apparently mistranslated when he speculated about adding an easier difficulty level to the game. Dark Souls Game Director Hidetaka Miyazaki expressed disappointment last week that some people may avoid the game because of its notorious difficulty. "This fact is really sad to me and I am thinking about whether I should prepare another difficulty that everyone can complete or carefully send all gamers the messages behind our difficult games," he said. Except that according to Dark Souls publisher Namco Bandai, he didn't actually say that at all. The company contacted Metro, which conducted the original interview, claiming that there had been a "translation mistake" and that what he actually said was, "This fact is really sad to me and I am thinking about how to make everyone complete the game while maintaining the current difficulty and carefully send all gamers the messages behind it." 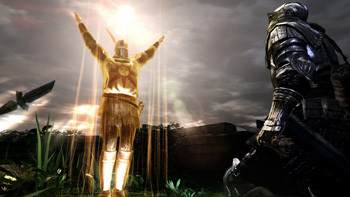 Metro acknowledged that the interview translation had been rough in spots but said that the statement in question was "pretty unambiguous" and even went so far as to state, "We're not sure whether we believe it was a translation error" or just damage control in response to the outrage of Dark Souls fans appalled by the idea of letting the less-masochistically-inclined demographic in on the fun. It's not an entirely unreasonable proposition; following the interview, many ardent Dark Souls fans leapt onto forums to argue that the difficulty is what makes it fun, and that easing up on it would compromise the entire experience.